Not so much here in Perth though, for us here it is almost hibernation time… Or isn’t it?! Winter is approaching fast, we already had a few very chilly mornings, and the days are getting shorter and shorter. Not a reason to spend all your free time snuggled up on the couch though. – Stay active, it keeps the blood moving and your muscles working and therefore generates warmth right within yourself. – If you are like me and don’t heat your house/bedroom on a consistent base, and therefore find it hard to get out of bed in the morning as it is freezing: set your alarm a little early. Once it goes off turn on the heating, and by the time it is time to get up, it will be nice and toasty. – As we are still having some very nice days, it is the perfect time to still go outside to catch the first and/or last ray of sunshine. Get those vitamin D levels right up there before it will be dark when you get up as well as when you finish work…. On further news, I am very excited to announce that I have added to my list of qualifications: Sandbell Trainer! On Thursday evenings at 6pm, Abbey trains with me on a regular basis. She does two other sessions with me throughout the week, and would like to have a buddy, or a few, on that session on Thursday evenings. Give me a shout and come along for a session. The more people, the more affordable it gets. Location most times is Crn Huntriss Rd/Norman St in Karrinyup. I have a pledge to you, which is that I will be more active on my website, posting more informative blogs about interesting things, and will put out more videos with exercises and stretches, starting this week! 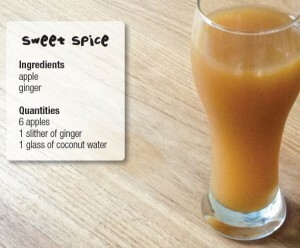 My Juice of the month for May is a delicious and easy, in season and will provide you with a little zing .